A number of elements able to paint the flame in unusual for a person of color. This is an amazing and breathtaking sight, which can be shown in the class in chemistry class, and home to your loved ones. After all, to change the color of the fire very easily. Many salts of alkali and alkaline earth metals have the property of flame coloration. Often their use in the production of missiles and fireworks. Usually use nitrates, rarely carbonates. Other salts will also give the unusual color of the flame. If you want to change the color of the flame of a spirit lamp, open it and add the alcohol, boric acid, and then ignite the wick. The reaction with alcohol produces a substance creativeart that burns bright green flame. To speed up the reaction can drip into the lamp sulfuric acid, which will act as a catalyst of chemical process. It is convenient to change the color of the flame on a gas burner. 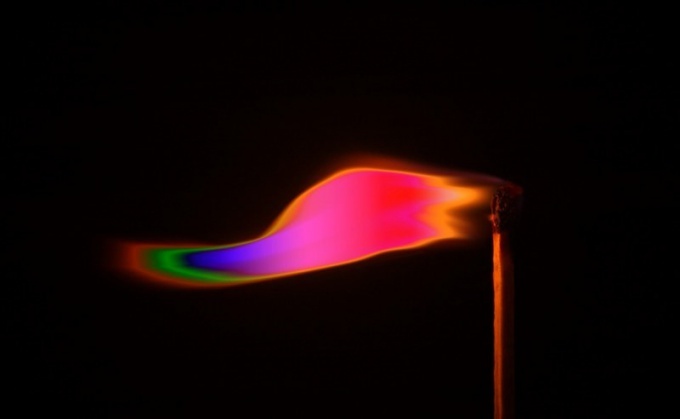 Ignite the nitrate or carbonate of potassium, and you will see how the flame acquires a violet color. Lithium ions are able to be painted fire red. Put lithium salt on a spoon and hold it over a gas burner and you will see how the flames will be transformed. The flame calcium gives a brick-red colour. Make fire mineral containing calcium, and you will be able to observe this beautiful phenomenon. Beautifully lit and salts of selenium. If you will burn the element, the flame will be painted in Indigo blue. And the molybdenum gives yellow-green color of the fire. From the effects of copper salts color the flame may vary. So, if you set fire to the nitrate of copper, the color is green, the chloride blue. By mixing the two salts in the flame will burn blue-green color. Shavings of magnesium will give you the crimson color of the flames. The only drawback to this experience is that chips are very quickly consumed. Ignite salt of barium or strontium, and you can see the flame is dazzling white. During the experiment remember that the room must have good ventilation. On the table should not be flammable substances. Also, do not for a long time to inhale the vapors of the burnt salt. After the end of the experience, open the Windows and ventilate the room.